Our Crate Washers are part of a complete range for effective plant design. Made entirely from stainless steel, this machine has been designed for quick and effective cleaning of poultry meat transport crates. Crates are completely immersed with hot water of approximately 55°C in the main wash zone, also allowing the addition of disinfectants for a hygienic cleaning. After the main wash section the crates are rinsed with fresh water. The re-circulated wash water is cleaned by means of a static sieve. Heating of the washing water can be made by using steam which heats up the washing water by means of a heat exchanger or by an electric heating system. The desired heating type would need to be indicated when placing an order. Various capacities from 150 to 800 crates per hour can be handled by 6 different types of machines. 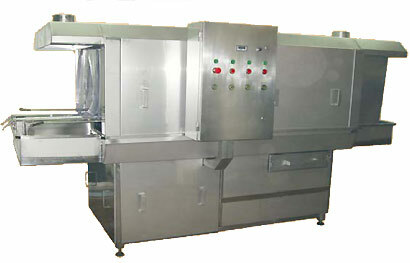 An optional a blower section is available with 1 or 2 blowers for crate drying.